An easy way to spice up your wardrobe is with the addition of a few pieces of jewelry. Some of the currently trending pieces can be found at great prices at both Target and Charming Charlie. If you haven't been to a Charming Charlie, you are seriously missing out. It's almost too much sometimes! You walk into the giant store and immediately notice that all of their jewelry and accessories are organized by color - SCORE! I would say, that in most cases, this could speed up your shopping trip, but even when I know I am looking for something in a particular color, I still end up wandering around the store for quite awhile. Most of the pieces are good quality (not excellent quality, but that's ok because you are not paying high prices). I decided to focus this week on a few pieces that I recently purchased, that I have been getting a lot of wear out of. I've also gotten a lot of compliments on them, so that's ways great. 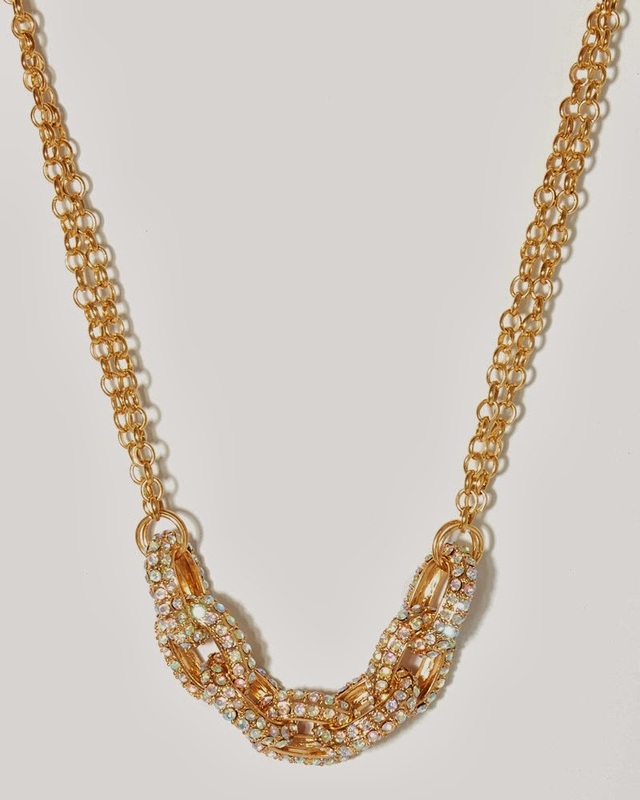 The first is the Lonna and Lilly Link Necklace with Clear Stone (Gold). You can find it here on the Target site for only $20. It's great for layering with other necklaces or as a stand alone piece. 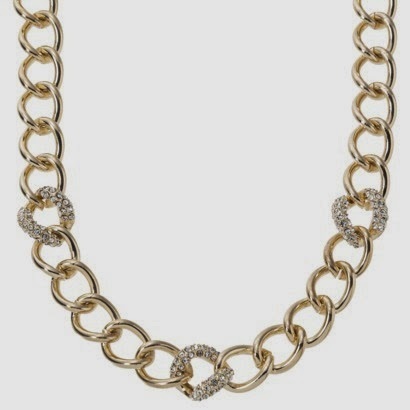 The next is the Starboard Chain Link Necklace from Charming Charlie. Click here to check it out (it's only $18). But, my absolute favorite necklace purchase was from Bauble Bar. It is the Acrylic Block Monogram. It's definitely on the higher end of what I like to spend on jewelry ($58), but I've worn it A LOT since I got it and it looks great layered with either of the necklaces I mentioned above (or a longer tassel necklace, like you see in the pic above). I got it in the shorter length with a gold chain and the antique gold acrylic 2 letter monogram. I was speaking with my principal the other day, after she spent the majority of her day doing walk-thrus in almost every single classroom, and found out the majority of the classrooms on my campus had students who were compliant and teachers who were teaching their butts off, but there was very little student engagement. The students were seated at their desks, listening or doing whatever the teacher had asked them to do, but bottom line...they were borderline comatose. I don't know why teachers fall into a rut or think that when students just "sit-and-get" that there is real learning going on, but I have to disagree BIG TIME! In my opinion, students aren't engaged and learning material unless they are actively doing it, talking about it, and teaching it to their peers. If you are looking for a simple way to get your students up and more actively involved, you may want to consider using Task Cards to ease you (and your students) into the transition. I think you'll find that your students love it and besides the prep work, it is relatively easy on you as well. Click on the image above to be taken directly to my new Task Card Bundle. I will often hear 2 partners in the hall arguing at a task card that I posted about what they think the correct answer is. Not that I promote arguing, but what it means to me is that they are thinking and speaking like scientists. Every good scientist provides evidence or reasoning to support his/her thinking. Often times, one student will convince the other student of the correct answer, but there are times when both partners record different answers. Either way, I know that real learning has taken place. They will more likely remember the debate they had with a classmate or when they got a particular answer wrong (that they were certain was correct) than just having me just tell them the correct answer. They may be used as a review (whole class or individual), to use for students who finish work early, to provide an alternate activity for advanced students (Gifted & Talented), at centers or stations, in pairs or small groups, and even with the whole class. There is really no right or wrong way to incorporate them into your classroom. Most often, I laminate the cards for durability (so that I can use them from year to year) and punch a hole in the corner and hold them all together with a binder ring. 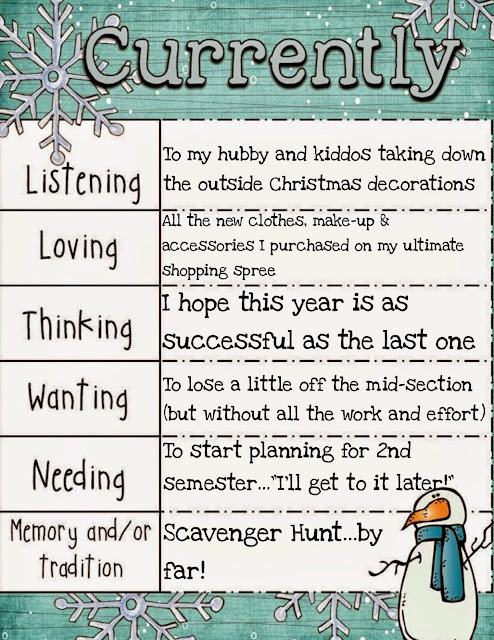 I just tape them around my room in various locations (or sometimes around the building or school campus), provide students with an answer sheet and send them on their way. I allow them to travel from card to card using their Interactive Science Notebook so that they can utilize it as a resource if needed. Today, I bundled 7 of my most popular task card sets together. This means that if you buy the bundle at the posted price, you will receive all 7 sets in addition to ALL future updates and revisions at no additional cost to you. You are "locked into" this price. Each time I add a task card set, I will increase the price for new buyers, but you won't pay a penny more! Just keep re-downloading the product to get the updates. What a deal! 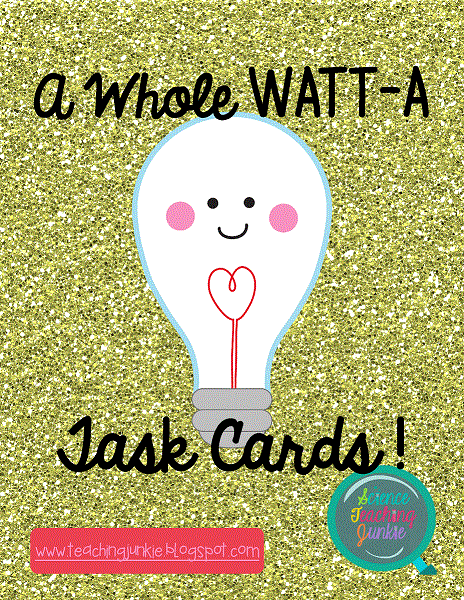 Click here to be taken directly to my TeachersPayTeachers store and check out the Whole Watt-a Task Cards Bundle. I recently surveyed my blog readers and one of the topics that several people wanted to know more about was my pacing for the school year. Figuring out a way to fit all of the material within the 38 or so weeks I have each year is a constant struggle, but I've almost mastered it. I've learned to "stay in my lane", which requires extensive knowledge of the content that is being taught prior to your class and the content that will be coming up in the next few years. If you know what knowledge your students are coming to you with, you don't have to spend time teaching it, but rather, reviewing and reinforcing it. 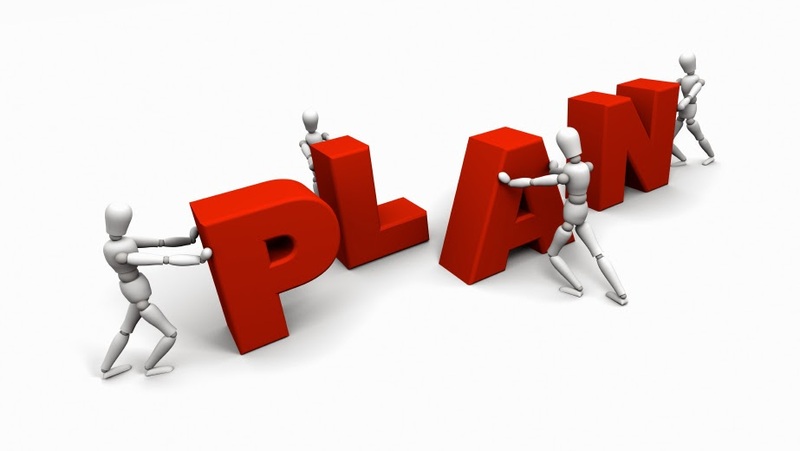 If you know where they are headed, you just need to do your part (not more, not less), so that they will hypothetically continue on with the proper foundations that the upper grades are expecting them to have. If your school or district doesn't have vertical or horizontal alignment, I would recommend that you do everything in your power to make that a priority. I am very fortunate in that my principal gives my department 1 day each six weeks to get together and have an entire day to plan. She secures subs for us and we devote the entire day to collaboratively planning with each other. We typically get about 3-4 weeks planned out in DETAIL, along with getting a lot of our copies made and laminating done. We still meet with our grade level teaching partner during our conference period at least twice a week, just to touch base or take care of the day-to-day stuff, but having the gift of time to get aligned is crucial. I have to be honest... about 4-5 years ago, I dreaded having to plan with the other same grade level science teacher. The balance was always off for a variety of reasons - either I felt like I was doing all of the work, we were planning, but then I'd find out that the other teacher wasn't "sticking to the plan", I felt like I could work more efficiently if I was left alone to do the work, there were personality conflicts, etc... (I could really go on for awhile). But now, my opinions on collaboratively planning have drastically changed. My teaching partner and I touch base every single day. We adjust and modify as needed, share ideas on what worked and what didn't, share our frustrations and celebrations. The balance is restored and the workload is shared! It is no longer my students and his students, but rather, our students. Before the school year begins, I get out my monthly 2-page calendar and lay out the grading cycles and important dates, such as holidays, etc... while looking at my school district calendar. Unfortunately I have the distinct honor of teaching a grade level that is tested with a standardized state assessment at the end of the year. So, on top of the normal pressures and stresses, I have to deal with making sure that my students remember the things they were taught in 6th and 7th grade, as well as the new information I taught them in 8th grade. This is where being an expert on the content comes into play. I can't tell you how much time I've spent getting to know my TEKS (Texas Essential Knowledge and Skills). If you don't REALLY know the content you have to teach, along with the depth and complexity of the concepts that you are responsible for, you are setting yourself up for failure. I also like to set aside some time before the state standardized test to review, so I typically spend anywhere from 2-3 weeks doing that. That for me is a non-negotiable, so it goes on the monthly calendar from the very beginning. In my opinion, to be great at the content you teach, you need to, at the very minimum, know the content 2 years prior and 2 years beyond the level you currently teach. If you don't, get your nose in a book and start reading up. Talk to the more experienced teachers that are willing to share what they know. DO SOMETHING! It drives me bonkers when new teachers get into the field and are forced to teach something they don't know and they don't do anything to better themselves. We are lifelong learners, so we are never too old to learn new things. I used to spend a significant amount of time at the beginning of each year going over safety and basic science skills, but I realized that every other science teacher was doing the same, so I thought of a more efficient way to use my time. I now spend very little time on safety and basic skills (no more than 4-5 days) and I embed it into what I'm doing throughout the entire year, constantly reinforcing, modeling and reminding them of those skills. It's still being taught, just in a different way. And it's probably more memorable for my students, not only because it keeps popping up, but because they are USING the skills in real situations, rather than just learning them and/or just talking about them. So, I guess I'll get straight to my yearly plan. Again, this is for my 8th grade science class in Texas. There is some "cushion" built into each grading cycle to allow for tests, quizzes and other things that frequently pop-up, such as school assemblies, needing to re-teach or spend more time on difficult concepts. 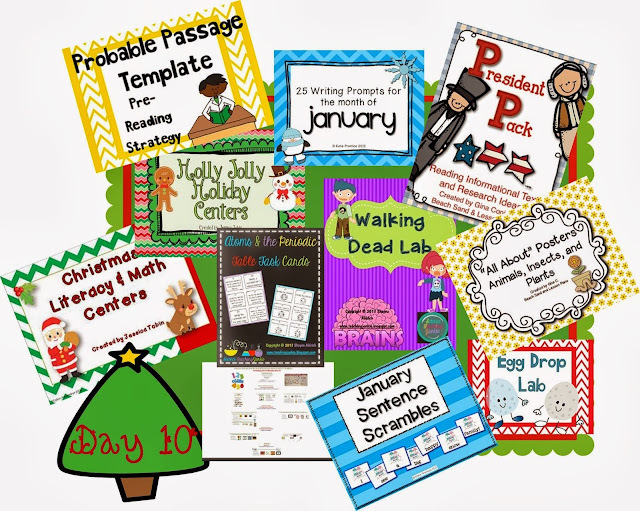 Unit 13: BrainPop Project** and just some fun end-of-the-year stuff (like science movies that relate to the content we learned, but I didn't want to sacrifice instruction time to watch the movies). ** My students get into groups of 4-5 and create their own BrainPop video to teach the incoming 8th graders about some of the topics they learned during the school year. Their scripts must be approved prior to filming and must follow a format similar to the "typical" BrainPop video. They have costumes, sound effects, the whole 9 yards! If you have any questions, please ask in the comment section below. I would be glad to elaborate on anything or help out on anything. 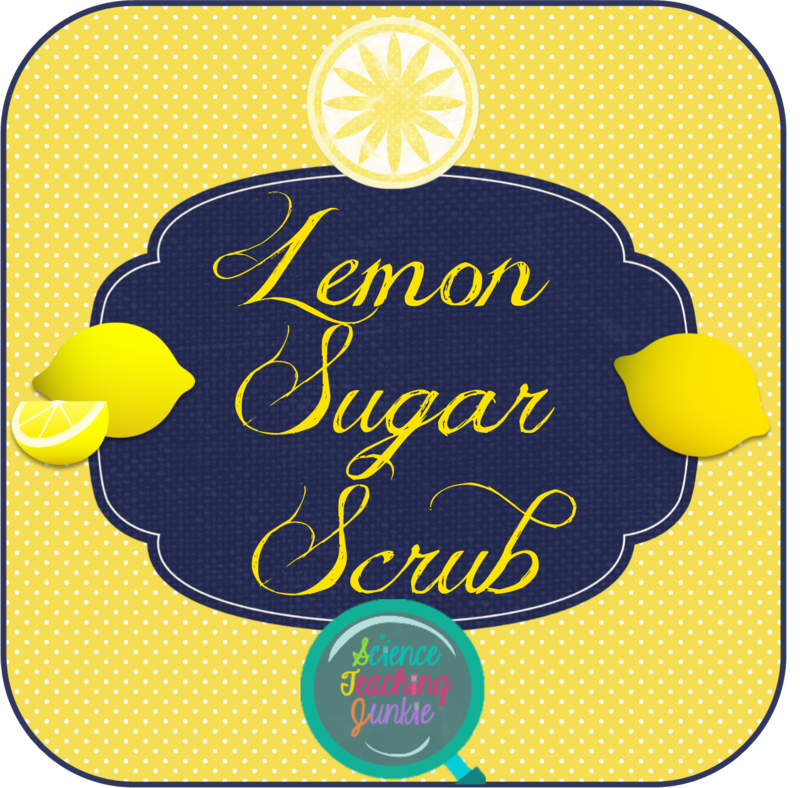 This week's "Find" is a wonderful, homemade face/body scrub - LEMON SUGAR SCRUB! 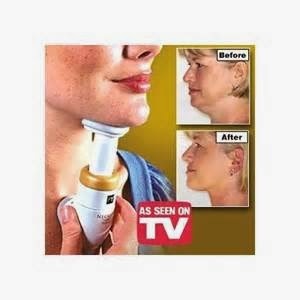 It can diminish scars and age spots. The antibacterial properties of lemon juice make it a great natural treatment for acne, which can speed up the healing of acne and prevent future breakouts. It can also successfully remove blackheads. If you have oily skin, it will help reduce oiliness. The citric acid provides a mini-face peel by removing the outermost layer of your skin and reducing shine. And your skin will be left looking brighter and feeling smoother. 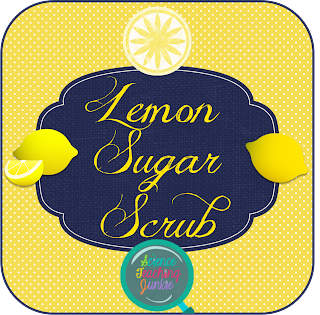 All you need is 2 lemons, about 1 1/4 cups of sugar, small strainer, a zester (optional), and a jar or similar container to store the scrub in. Because your skin is the largest organ in your body (little science fact), it's best to use organic products! You don't want any bad/unnatural chemicals absorbing into your skin. In a mixing bowl, zest the lemons (optional). Cut each lemon in half and squeeze the juice into the bowl (use a strainer to catch all of the seeds). Add sugar and stir until well combined. If you prefer a more grainy sugar scrub, add more sugar. 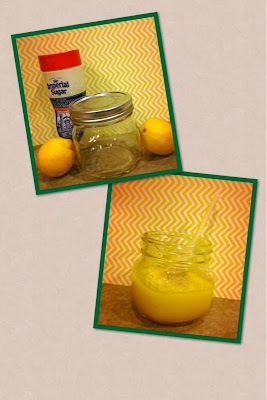 Pour the lemon sugar scrub into the jar. If you happen to get a little in your mouth...no big deal! I take a little lick every once in awhile because it's so delicious! It's like the world's best lemonade on my face - How could I resist? Rinse your face with cool water and feel the difference. I would recommend doing this at least 2-3 times a week, but you could do it every day if you wanted to. Note: I started doing this scrub almost daily about 2 weeks ago. I have had so many compliments lately that I look younger and I can definitely notice that my skin has been clearer and smoother. Give it a shot and don't forget to share you results with us. I don't really do the New Year's Resolution thing, mainly because I know it won't last long and because I am so stubborn, that if I am told to do something (even if it is by myself), I am most likely to want to do the complete opposite. Does that make me cray-cray? But over the Christmas break I vowed to do a better job of looking presentable and doing my best to stay "on top of" the latest trends. And the biggest hurdle I have to overcome is doing it all with a teacher's salary. My hubby is also a teacher/coach and we have 2 daughters, so we certainly aren't rollin' in the dough, makin' it rain, big ballin'... Okay you get the point. But where I am lacking in the fat wallet department, I make up for in thriftiness. That's right! 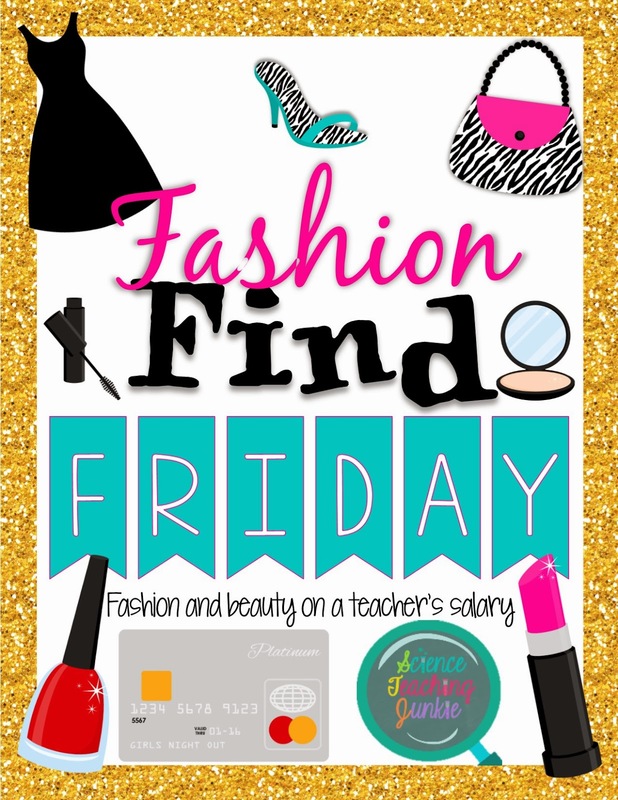 My mission is to share my fashion and beauty finds with my fellow teaching friends, so that they too can look FABULOUS and FASHIONABLE without breaking the bank. I will be sharing products that I love, clothing and accessory finds, tips, videos, how-tos, discounted items, online stores with great deals, my favorite beauty blogs, etc... Nothing is off limits! Well except for those really expensive items that look great but cost way too much. Duh! This week's find is a great shop that I found called "Pick Your Plum". I have already purchased several items from them (jewelry, crafting supplies, and clothing) and have been completely pleased. They have a great variety of high quality products for low prices. And who doesn't love that?!? Every day they post new items at 7 a.m. Mountain time such as: clothing & accessories, party & crafting supplies, home decor & a few surprises every now and then. And they have a 30-Day Unconditional Guarantee. You can return any product for any reason within 30 days of receiving it. Cool beans! 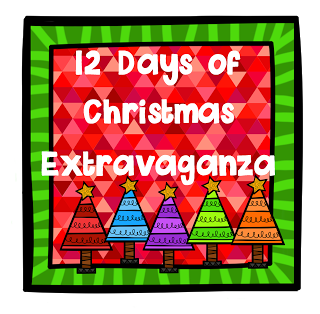 Several of my products are being featured in a huge 12 Days of Christmas Extravaganza giveaway over at Jennifer's blog, Teaching With Grace. Click on any of the images below to be taken directly to her giveaway. But don't delay...the giveaway won't last for long! There are also some freebies at the end of the post, so don't miss 'em!